The closest 'perfect' frames I've seen in Wildstar to date. 1 Request, add the full groupanel menu to VRF so I can disable the carbine group panel. Otherwise thank you so much for such a wonderful addon! As far as i know you have to have the cogwheel (with role selection, leave raid etc) open to use it. 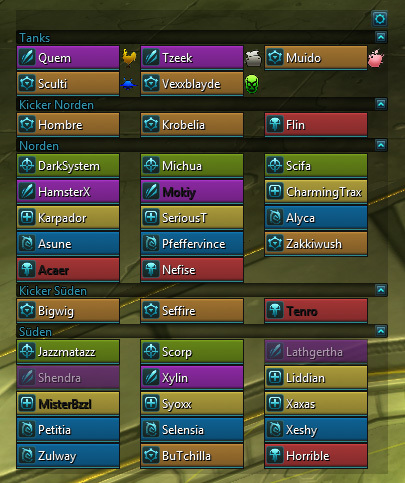 Also only the raidleader is able to create groups and change the order of players. I can't seem to get some of the functionality of the add-on to work. Specifically, right-clicking on a group does not create a context menu, so I can't make more groups or organize members properly. I definitely have the newest version. Is there perhaps some other add-on that this is dependent on or might be conflicting with that you know of? Hey. Many people seem to dislike this space on the right of each member that is reserved for icons such as marks. Maybe you could add an option to instead show it on top of the hp bar. This is not coming up as an option under Wildstar addons on the Curse downloader. Also, something super weird happening with the color window? Any chance this will cover party frames as well?